Being on the steep side of a learning curve can sometimes seem overwhelming. And jumping into learning about digital badges is no different. If you iterate around three main concepts, and with each iteration deepen your understanding all will be good. If you have landed here without first reading the badges about page, it is suggested you go back and read what badges are all about; About Badges. There really is a whole bunch of technology that went into building open badges. Particularly, when you consider that all badges need to be confirmed as genuine and that loads of different organizations will be issuing badges. More on this as you deepen your understanding of badges. The first thing when developing an understanding of badges is to consider the three main roles of; earner, issuer and displayer. And how these three roles work together within the whole Open Badges Infrastructure (OBI). The earner is anyone who wants to earn a badge. And they are willing to focus their energy and make an effort to acquire the skills and knowledge that demonstrates their mastery represented by the badge. 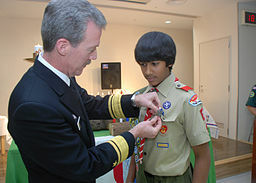 Badges are everywhere, and are particularly present in our youth. Girl Scouts can earn badges, Students in sailing school can earn badges, Swimmers can earn badges. It is these badge systems where people prove skills, knowledge and ability and from this they earn badges. If you want to jump deeper into understanding the technology behind the earner follow this link to the technical documentation of onboarding the earner. The earner will store their badges is a digital backpack. The backpack is the online digital place where the earner can store and manage their badges. By managing their badges they can be put into groups or be made private and not be available for display. The issuer creates the badge, figures out what skills and knowledge are represented by the badge, and figures out how to assess (or prove) if a person has the skills and knowledge to earn the badge. The issuer has a lot of heavy lifting to do, this is because determining if someone has mastered the skills and knowledge and are deserving of a badge requires work and should be rigorous if the badge is going to hold value. There are may ways to assess peoples abilities and knowledge. Figuring out effective ways to assess these is also the responsibility of the issuer. The assessment methods used for the badges available in our youth are proven and have considerable rigor. For example, the assessment of the skills and knowledge to get a scouting badge is done with well articulated criteria and assessment forms within a master - apprentice model. Once the badge earner has proven their skills and knowledge against the criteria as assessed by the master, they are issued a badge. It should be noted that there are many approaches to assessment and what is described here is only one approach. The important thing is that the issuer needs to figure out how to assess if the earner is deserving of the badge. If you want to jump deeper into understanding the technology behind the issuer follow this link to the technical documentation of onboarding the issuer. The displayer provides the ability to display badges. This could be a social media site like facebook or it could be your own personal wordpress blog. The displayer will retrieve badges from an earners backpack and display them for all to see. The groupings and permissions around the display of badges will be determined by the settings in the backpack. If you want to jump deeper into understanding the technology behind the displayer follow this link to the technical documentation of onboarding the displayer. These three roles can be found in the diagram enclosed. The Issuers and Displayers are obvious as they each have their own box in the diagram. The Earner role isn't so obvious because, as a technology, the earner becomes the backpack. You could say the Earner is holding their backpack. 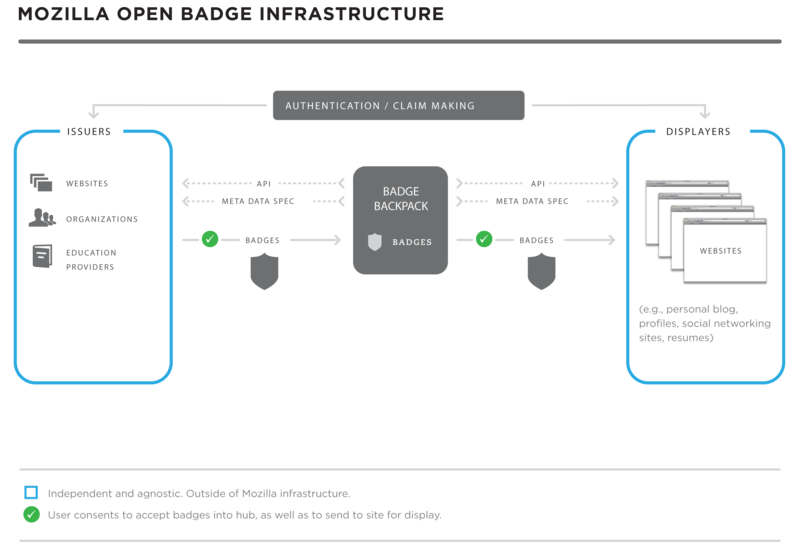 From a technology perspective and an infrastructure view the Issuer is the provider of badges, the backpack stores the badges earned and the displayer shows them to the world. With a close inspection of the diagram above there are a number of boxes, lines, images, and text. All of these represent a piece of the technology that makes up the Open Badges Infrastructure. As you learn more about the badges technology you will become familiar with all the elements found in the diagram. Take the time to review the diagram, reflect upon the Earner, Issuer and Displayer roles and how they would interact to display a badge. One question to really get you thinking is. "How do you determine if a badge is genuine?" Don't think about this from an open badges technology perspective, think about it from a real world girl scout badges or sailing school perspective. Think again, think further than if the badge looks official... "how would you really determine if a badge is genuine?" I am currently doing some research for the eLearning department at AkzoNobel and find your blog really helpful. Thanks for sharing!